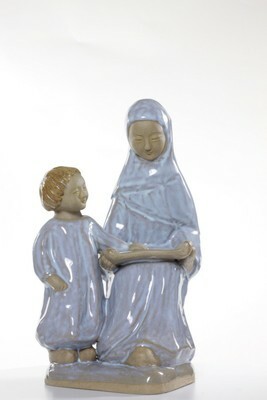 Clay sculpture glazed with light blue glaze, depicting two figures. Mary is the seated figure, holding a partially unfolded scroll on her lap, and smiles gently as she shows it to the smiling, standing figure of Jesus as a child. His left hand rests on the base of the scroll. The clay and glaze are distinctive marks of the works of a Trappist monastery.